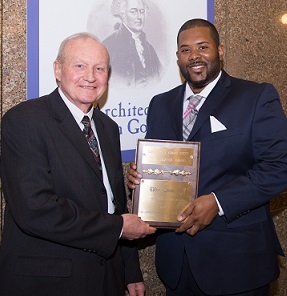 This year’s recipient is Eddie Coren Jr. For the past five years, Eddie has worked as a criminal defense investigator in the CPCS Plymouth County Trial Office in Brockton. Eddie’s success is partially due to his cultivation of liaisons with law enforcement, state agencies, and community leaders. He has reliably handled the high volume of cases assigned to him by the seventeen attorneys who depend on him. They are assured that Eddie’s talent and dependability in investigating all the facts and circumstances in a case will provide their clients with the highest level of service and protection of their constitutional rights. Eddie grew up in Boston public housing, living in three different public housing developments in Roxbury and Dorchester. He met his wife, Chandize while both were attending Boston English High School from which they graduated together in 2001. He is taking courses towards his college degree and is an active volunteer and coach in the Brockton community. Prior to joining CPCS, Eddie worked as a Special Police Officer in Boston public housing, as well as a counselor at a juvenile residential facility. Eddie would tell you that his biggest accomplishment has been raising his two boys, Eddie III, age 11, and Nyles, age 9, with his wife Chandize, and supporting his wife as she became a Nurse Practitioner at Boston Medical Center. Our investigator family is proud and fortunate to have an investigator with Eddie’s background, dedication, and passion for our clients.